US Military Carpenter's belt. 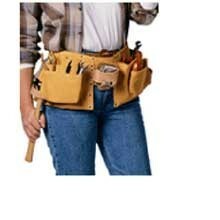 Specially designed to US military specifications, this tool belt comes with all of the carpenter's necessary features. Made of heavy suede leather, pocket area riveted to a nylon pin-hook belt. Belt adjusts to 48 inch Waist. This tool belt boasts a hammer hockey, tape measure hockey. Multiple pockets will allow you to eliminate those extra trips back to the tool box. Tools not included.